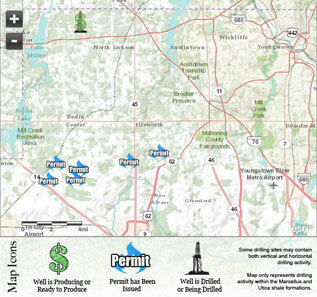 Published: Sat, November 29, 2014 @ 12:00 a.m.
An environmental group is calling on Attorney General Mike DeWine to provide support for the governor’s effort to penalize law breakers, saying a new bill would cripple state enforcement against fracking polluters. An Ohio Senate committee this week began hearings on House Bill 490, hearing testimony from top Kasich administration officials urging the Senate to restore provisions to the law to properly penalize violators of Ohio’s fracking regulations. Changes by the state Legislature to Gov. John Kasich’s original proposal, coupled with further roll backs of current law, may leave fewer tools and weaker penalties for fracking-law violations, opponents say. On Friday, the Ohio Environmental Council sent a letter to DeWine — the state’s chief law-enforcement officer — urging his office to weigh in on the debate to reduce the fracking enforcement. According to OEC’s letter to DeWine, the group fears that the future of the state’s enforcement capabilities will be jeopardized. “The attorney general must act swiftly to make certain that the Legislature restores strong penalties to stop flagrant or repeat polluters dead in their tracks, and to ensure protection of health and safety,” Dougherty added. In light of the 2013 criminal dumping of 30,000 gallons of oil and gas drilling waste into a into the Mahoning River near Youngstown, Kasich proposed improvements to the enforcement of the oil and gas industry. The governor’s proposal, introduced in the General Assembly as House Bill 490 last spring, increased penalties for oil and gas and brine-disposal violations and empowered regulators to review the history of violations of companies looking to drill in the state. The environmental council says Ohio’s oil fields and gas lands recently have experienced an explosion in a pipeline transporting toxic substances through Monroe County; evacuation of homes within a two mile radius of a leaking well-head in Jefferson County; a worker killed in an explosion at a Noble County fracking site; and a well-pad chemical fire in Monroe County that engulfed 20 semi trucks, triggered 30 explosions, prompted the evacuation of 25 homes and resulted in a 54,000-gallon chemical spill into a tributary of the Ohio River. Expanding ODNR authority to suspend operations and revoke permits for dangerous and harmful violations. Allowing ODNR to deny permits to violators that have failed to fix existing violations. Requiring full background checks of owners and key employees of companies and subsidiaries who want to drill or dispose of brine in Ohio. Increasing civil penalties on fracking law violators. Boosting criminal monetary and imprisonment penalties for the most flagrant polluters. The bill is before the Ohio Senate Agriculture Committee, where it is expected to be voted on in the next two weeks. Craig Butler, Ohio EPA director, said it’s important this law be updated to ensure Ohio does not have to rely on the federal government to respond to violations that occur within its borders.